Pay 800 Life Points. 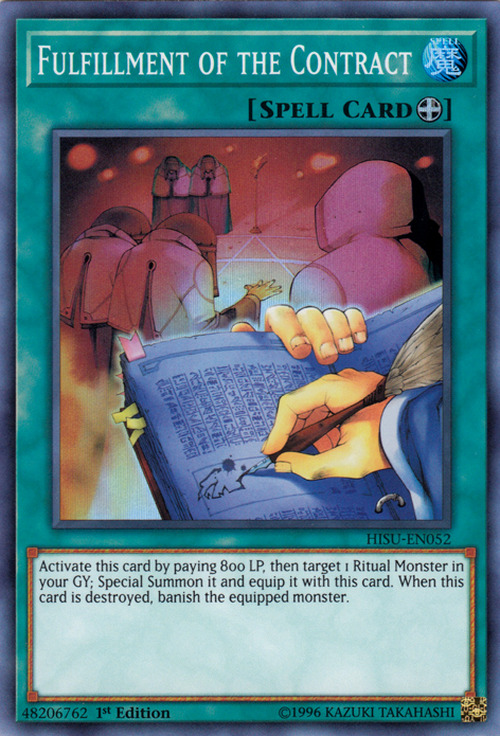 Select 1 Ritual Monster from your Graveyard, Special Summon it, and equip it with this card. When this card is destroyed, remove the equipped monster from play. This card has a Fusion counterpart, Re-Fusion, as well as a more general counterpart, Premature Burial. It is also possible that this card's Synchro counterpart would be Wicked Rebirth. The artwork shows a ritualistic circle on the ground. You cannot use "Fulfillment of the Contract" to Special Summon a Ritual Monster that was discarded from the hand, or otherwise not properly Summoned. You can chain to the first part of this card's effect. However, the last part (that destroys the monster) does not start a chain.